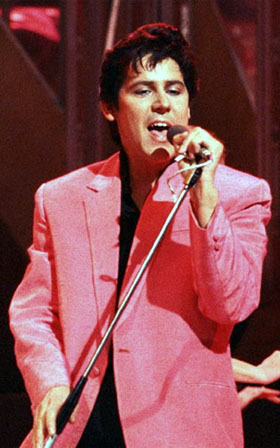 Shakin' Stevens, also known as "Shaky" (born Michael Barrett, 4 March 1948) is a platinum selling Welsh rock and roll singer and songwriter, who has the distinction of being the top selling male UK singles artist of the 1980s. His recording and performing career began in the late 1960s, although it was not until 1980 that he saw commercial success in his native land. In the UK alone, Stevens has charted no fewer than 33 top 40 hit singles in the sales charts, making him one of the most charted (and biggest selling) acts of all-time. 1990 • There Are Two Kinds of Music… Rock and Roll!